That’s right, exercise doesn’t just make you look good, it helps you feel better about yourself. Personally there is no better way to clear my mind than a run. There is no better way to hammer out my stress than lacing up my trainers, plugging in my headphones and pounding the pavement. Sometimes it’s the first thing I do when returning from work just to get myself out of “work-mode”. When I don’t feel like running, I practice some yoga as there is no better buzz than a great yoga flow. I’m not a huge yogi, I just find a YouTube video, find a quiet space, stretch out and breathe for a good half an hour. Studies show that those who workout and stay active on a regular basis feel less stressed, less anxious and generally happier! Exercise; releases “happy chemicals” into your brain, increases energy levels, fights fatigue, provides an immediate mood boost, mimics the effects of antidepressants on the brain and combats insomnia! So next time you’re tired, anxious, angry, stressed why not try a workout instead. I always go for running first followed by yoga. My go to YouTuber for Yoga videos at the moment is Yoga with Adriene. Or you can try the workout below! The yoga sequence above is from mindbodygreen.com and is designed to wake up the body and target all the places that might need a little extra space and life breathed into them after a night of sleep. Now you don’t have to do this in the morning, you could do it after finishing work – a little pick me up for the evening. No matter when you do it, it will leave you feeling relaxed, refreshed and cheerier than before! 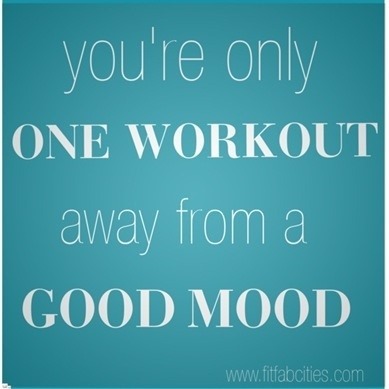 What is your go-to workout to boost your mood? Any specific workouts you think are great stress relievers? I try and do stretches and yoga for fifteen minutes every morning to relax and ease into the day.